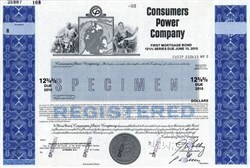 Beautiful bond certificates from the Consumers Power Company . These historic documents were printed by the American Banknote Company and has an ornate border around it with a vignette of Greek gods flanking a map of Michigan. This item has the printed signatures of the Company's Chairman of the Board, and Secretary. Consumers Energy is a public utility that provides natural gas and electricity to more than 6 million of Michigan's 10 million residents. It serves customers in all 68 of the state�s Lower Peninsula counties. It is a division of CMS Energy. Its headquarters is in Jackson. The company was founded in 1886 as Commonwealth Power Company by William A. Foote, originally tasked to install electric lighting in downtown Jackson. (His wife later founded Foote Hospital, also in Jackson, Michigan.) After a series of acquisitions and mergers involving other local electric, gas, and trolley companies which were properties of W.A. Foote, as well as Anton G. Hodenpyl and H. D. Walbridge, the company incorporated as Consumers Power Company in 1910 in Maine, and became part of the utility holding conglomerate Commonwealth and Southern, which held utilities in 10 other states. Commonwealth and Southern dissolved in 1946, leaving Consumers Power (and all other utility holdings) an independent company. In 1968, the company reincorporated in Michigan and their headquarters were located in Jackson, Michigan. Consumers operated the Big Rock Point Nuclear Power Plant in Charlevoix from 1962 to 1997 and built the Palisades Nuclear Plant near South Haven in 1971, which is still in service. In 1968, Consumers Power began construction of a nuclear power plant in Midland, Michigan, primarily for the Dow Chemical Company. The project's budget was $257 million, with completion anticipated in 1972. Extreme construction problems caused years of delays and costs soared. The Three Mile Island accident in 1979 resulted in a massive change in nuclear regulatory requirements and system redesign. When it was revealed that the containment buildings were settling and foundation cracks were discovered, Dow cancelled their contract with Consumers Power, and the project was abandoned in 1984. The $4.1 billion investment nearly bankrupted Consumers Power. However, in 1985, Consumers Power formed a partnership with eight other companies to convert Midland's abandoned nuclear plant into a gas-fired power plant. Transformation of the plant began in 1986 and was completed at a cost of $500 million. The Midland Cogeneration Venture began producing power in 1991 and that success restored faith in Consumers Power. In 1997, the name of the company was changed to Consumers Energy. Consumers Energy's trademark slogan is "Count on Us", and they are now a subsidiary of CMS Energy. Specimens were also used to show prospective clients different types of certificate designs that were available. Specimen certificates are usually much scarcer than issued certificates. In fact, many times they are the only way to get a certificate for a particular company because the issued certificates were redeemed and destroyed. In a few instances, Specimen certificates were made for a company but were never used because a different design was chosen by the company.